Your smartphone carries an enormous amount of sensitive information about you and your life. If you have been arrested or detained by a Florida police officer, they may want to look through your phone. However, you have a legal right to keep your phone and its contents free from an unreasonable search. Florida police officers cannot simply compel you to hand over access to the contents of your phone. While police officers may take your phone (and your keys and your wallet) from you during an arrest, they cannot conduct a search of the contents of your phone without a warrant or probable cause. 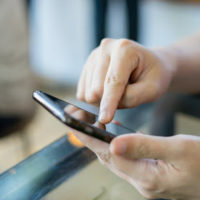 In this article, our Miami criminal defense attorneys highlight the three most important things that you need to know about your cell phone and police officer searches. Under the Fourth Amendment to the United States Constitution, you are protected against unreasonable searches and seizures. This legal protection extends to electronic devices, including your cell phone. With limited exceptions, a Florida police officer cannot simply search your cell phone without a warrant from a judge. In addition, you are never required to give up your cell phone password to a police officer. It must be noted that Florida law enforcement officers can conduct cell phone searches if you give them permission. A Miami police officer may ask to take a quick look at your cell phone. If you say ‘yes’, then that officer will almost certainly conduct a legal search. Once an officer gets your consent, their ability to conduct a search expands dramatically. You should never give officers access to your phone. If you have been suspected of a crime, even if you are entirely sure that you did nothing wrong, and you want to help and support law enforcement, you should still not consent to a cell phone search. It is not in your best interests to do so. Work with police through an attorney. If a Florida police officer conducts an illegal search of your cell phone, your computer, your vehicle, your home, or your person, you should not resist the search. Resisting an illegal search will not only fail to prevent the search, but resisting may also get you into serious legal trouble. If an unlawful cell phone search has been conducted, your rights have been violated. You should speak to an aggressive criminal defense lawyer as soon as possible. Your lawyer will be able to review your case and take whatever action is necessary to protect you. At Ratzan & Faccidomo, LLC, our skilled Florida criminal defense lawyers are standing by, ready to provide you with an aggressive legal defense. If you or a family member was arrested, contact our office as soon as possible. Consultations are confidential and free of charge. We are based in Miami and we represent defendants throughout the region, including in Miami Beach, Coral Gables, Hialeah, and El Portal.